This sign advertises Evinrude outboard motors. The sign is rectangle and is yellow and blue. The sign pictures an outboard motor and a picture of two men riding in a boat. 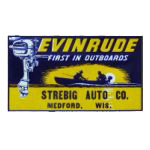 “Evinrude / First in Outboards” appears at the top of the sign. “Strebig Auto Co. / Medford, Wis” is printed at the bottom.